About the author: Born in Switzerland in 1970, Daniel López is the main photographer for the magazine The Okinawan. After traveling worldwide, he established his residence in Okinawa in 2003. Today, while following a master at the University of Arts of Okinawa, he works as an independent artist realizing photographic and design projects. Introduction:For his first book, Daniel López decided to focus on Okinawa’s walls (façades in French), shooting the many unusual walls that can be found in Okinawa. 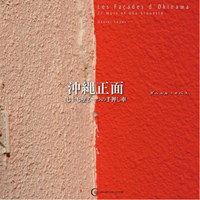 Far from the tourist shots that are so present when it comes to introducing Okinawa, he choose those walls (and one wheelbarrow) that describe so much Okinawa and its champuru culture, making it a photography book that deserved to be in the library of any Okinawan fans.